When it was discovered in 1998 that the expansion of the universe was accelerating, there was no known force that could be responsible other than resurrecting Einstein's Cosmological Constant. Since a constant isn't a force, "dark energy" was the name given to the unknown force that is believed to be driving galaxies away from each other against the pull of gravity. Nothing comes close to the description of dark energy in the "Standard Model" of fundamental particles and forces developed by quantum physicists. What Do We Know About Dark Energy? We know that Planck satellite data indicates that ordinary matter (made up of atoms) makes up only 4.9% of the universe . 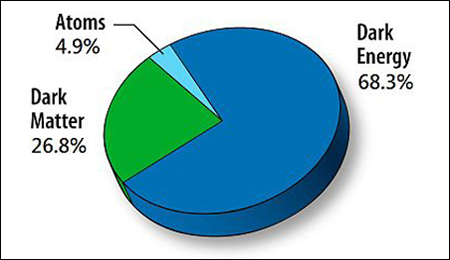 That "dark matter" (not made up of atoms) makes up 26.8%. And, that "dark energy" makes up 68.3% of the universe. We also know that that the universe's expansion rate was initially decreasing but started to increase at an accelerated rate about 6 billion years ago when the universe was about 8 billion years old. (See the recent BOSS universe expansion curve.) It started accelerating because as the universe expanded, the limited amount of matter in it did also. Therefore, the average density of matter decreased, and thus the strength of overall gravity weakened because it depends on the density of matter. On the other hand, dark energy is presumed to have expanded as space expanded because dark energy is thought to be an intrinsic element of space itself. When the universe reached about 8 billion years of age, the density of dark energy exceeded the density of matter. As a result the excess dark energy pressure caused the universe to begin to expand in an accelerated fashion. This is the main thesis of dark energy theory that today most physicists believe to be true. Shown at the left is the Galaxy Evolution Explorer (GALEX) satellite designed by the Jet Propulsion Lab at NASA/Caltech. Results from the GALAX Survey Project along with data from the Anglo-Australian Telescope atop Siding Spring Mountain in Australia, confirm the theory that dark energy is a smooth uniform force "all across the universe" that dominates the effects of gravity. It also rules out a dark energy gravity theory which suggested that at large distances gravity reverses its role and becomes repulsive. 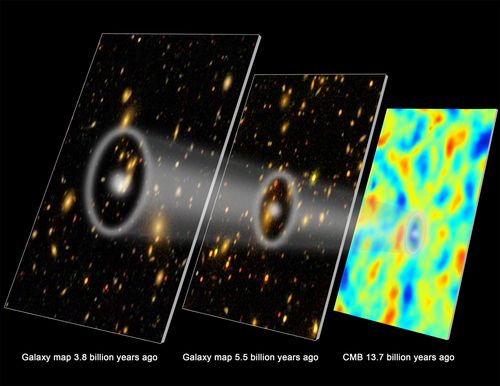 The Caltech GALAX Survey (2006 to 2011) of 200,000 galaxies, stretching back seven billion years in cosmic time, has led to an independent confirmation of the SDSS/BOSS Survey that dark energy is driving our universe apart at accelerating speeds. "Sound waves" from the very early universe have left imprints in the locations of galaxies, causing galactic pairs to be nominally separated by approximately 500 million light years. These observations are a result of careful measurements of the separations between many, many pairs of galaxies. The gravitational pull of a galaxy cluster attracts other galaxies locally, but dark energy pushes them apart on a larger cosmic scale. Physicists are able to statistically average the dark energy's repulsive force measured over thousands of pairs of galaxies. See the SDSS/BOSS Survey section for a more detailed explanation of "sound wave imprints". This dominant theory says that "empty space" is not really empty. We know space bends and curves around large objects as in gravitational lensing. In addition, it apparently has its own inherit energy. This theory is embedded in Einstein's General Relativity equations. His original equations implied the universe was either expanding or contracting but not in a "steady state" (i.e. static). Einstein recognized this and it bothered him that his equations allowed the universe to contract, as he believed at the time that it was static. So he arbitrarily introduced a "cosmological constant" (noted as the Greek capital letter Lambda "Λ") into his equations to prevent the universe from either collapsing or accelerating, but to remain static. Einstein's original equations did allow for more space to continuously come into existence (i.e. universe expansion) if the cosmological constant was zero. In 1929, Hubble in fact showed that the universe was actually expanding and it forced Einstein to remove his constant calling it the "biggest mistake of my life". This does not mean that space is expanding into some kind of vacuum. 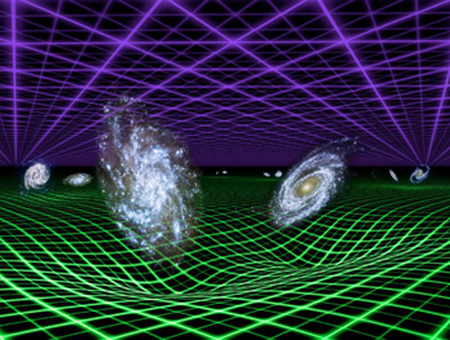 It means that space-time itself is growing, which means that more dark energy is also growing. As a result, this form of energy, as it grew and overcame a constant amount of gravity, eventually caused the universe to expand faster and faster. With the discovery of accelerated expansion in 1998, scientists had to re-enter "Λ" back into the equations, but this time for a different purpose. If the force of gravity is considered a positive force as it pulls things together, then the cosmological constant is a negative force as it repulses gravity. They called "Λ" dark energy for lack of a better name for an unknown force. Currently some scientists refer to this force as "negative energy" or "vacuum energy" because it it is more descriptive, but the most popular term remains "dark energy". Another possible explanation for how space might acquire energy comes from the "quantum theory" of matter. In quantum theory, empty space is not empty at all, but is full of energy in the form of invisible electro-magnetic waves. These waves fluctuate wildly, continuously forming temporary "virtual" particles (particle/antiparticle pairs) that then immediately annihilate each other and electrically cancel out in a time span too short to measure. (Hence our human perception of an empty vacuum.) However, the average vacuum energy is not zero, but a minimum quantity, called the "zero point" energy or "ground state" energy. Quantum theory also postulates that all particles exhibit wave behavior, so the fact that waves turn into fleeting particles and back again is not anything revolutionary. Some scientists refer to outer space as the "quantum vacuum". A real world example of quantum theory is the "Casimir Effect". 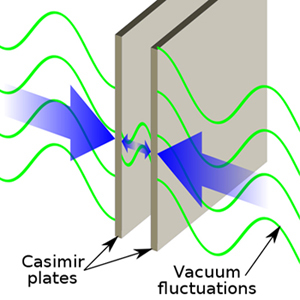 The Casimir Effect is a small attractive force in a vacuum that acts between two "un-charged and un-connected" very close parallel metal plates causing them to move towards each other all by themselves. In 1948 Dutch physicist Hendrik Casimir imagined two metal plates so close together that the distance between them was comparable to the wavelengths of the virtual particles. He realized that the plates would be pushed together because only particles with a wavelength smaller than the gap between the plates could survive in the gap. Whereas particles of any wavelength would be on the other sides of the plates. Thus, there would be more particles pushing in than pushing out and the plates would be forced together. The Casimir Effect has been experimentally verified in the laboratory (See The Force Of Empty Space) and is accepted by almost all scientists. However, when physicists calculate how much "vacuum energy" this would give all of empty space, the answer comes out way too large, 10^120 times larger than currently measured, that is a 1 with 120 zeros after it. No one can accept a theory that is this far off, so this theory as proposed can not be correct. However, almost all current scientists believe that today's quantum theory, while explaining most of matter, is incomplete because of this vacuum energy issue, the fact that it does not incorporate gravity and some other minor problems. Someday, somehow scientists believe these issues will be rectified by a new version of quantum theory or another completely new theory. So the basic idea of combining quantum theory with dark energy is alive going forward, but on somewhat shaky ground. Quintessence originates from the ancient Greeks who believed there was a pure "fifth element" thought to fill the universe beyond earth. The Romans (in Latin) called it "quinta essentia", hence Quintessence. A modern dictionary says quintessence is "the purest and most concentrated essence of something, such as relaxing and living stress free". Modern physicists refer to it as possibly the "fifth force" in the universe after the four known modern forces of nature (not the same as the original Greek four elements - earth, air, fire, and water). Dark Flow. Alexander Kashlinsky is a cosmologist at NASA's Observational Cosmology Laboratory at the Goddard Space Flight Center in Maryland. In a series of papers over the past few years, Kashlinsky and his colleagues have shown that the region of space-time which we occupy, a huge region at least 2.5 billion light years across, is moving fast relative to the rest of the universe. Some cosmologists remain skeptical about this "dark flow," as it is called. They say that more evidence is needed to persuade everyone that this phenomenon is real. But the evidence that does exist is compelling. Based on light collected from galaxy clusters, Kashlinsky says our bubble of space-time is moving at 2 million miles per hour relative to our galaxy neighbors. As detailed in a new paper recently posted to the physics and mathematics site, www.arXiv.org, Zhong-Liang Tuo and colleagues at Key Laboratory Frontiers in Theoretical Physics in China have identified a "preferred axis" in the expansion of space-time by looking at light from more than 500 supernovas. By measuring how much the light from each of the supernova explosions is red-shifted, they measured the rate of expansion of different parts of the universe. They found that our region is moving more towards the constellation Vulpecula in the northern sky than it is in any other direction. Previously, a "preferred axis" in the expansion of space-time was also detected in the cosmic microwave background (CMB) pointing in the same direction. Acceleration An Illusion. A new theory by Christos Tsagas, a cosmologist at Aristotle University of Thessaloniki in Greece, suggests that the accelerating expansion of the universe is merely an illusion. A false impression results from the way our particular region of the universe is moving through space. His theory says our relative motion makes it look like the universe as a whole is expanding in a accelerated fashion. While in reality, expansion is really slowing down, just as would be expected from ordinary gravity. By not taking into account the dark flow, we get the false impression that the whole of space-time has entered an accelerating phase. If you're swimming in a river with the current, you move faster than when you swim upstream against it. Tsagas argues that this is why we perceive the expansion of space-time as faster in the direction of our motion than any other direction. Tsagas has also said the "preferred axis" alignment of the CMB with our motion is no mere coincidence. The CMB axis is another illusory effect of the "dark flow" of our space-time bubble. Tsagas explains our observations of the expansion of space-time without invoking dark energy. According to Tsagas, the acceleration of the universe in our immediate vicinity is caused by motion alone. The universe beyond our region isn't accelerating outward. Rather, it is rolling to a stop as predicted by Einstein's equations. 6) Is Time Slowing Down? Professor José Senovilla, Marc Mars and Raül Vera of the University of the Basque Country, Bilbao, and University of Salamanca, Spain have proposed that time itself could come to an end in billions of years - and everything will grind to a halt. Time slowing down would be an alternative explanation for "dark energy". Senovilla suggests that we have been fooled into thinking the expansion of the universe is accelerating, when in reality time itself is slowing down. At an everyday level, the change would not be perceptible. However, it would be obvious from cosmic scale measurements tracking the course of the universe over billions of years. Time change would be infinitesimally slow from a human perspective, but in terms of the vast perspective of cosmology it could easily be measured. “We do not say that the expansion of the universe itself is an illusion," Senovilla explains. "What we say would be an illusion is the acceleration of the expansion." Scientists look for Ia supernovas to provide distance benchmarks assuming time is a constant. If time is slowing down, then time itself is a new "space dimension". Therefore, the far distant ancient supernovas would only appear to show the expansion was accelerating, whereas it is really only time slowing down. New Data. In 2012 after a two-year study, scientists at the University of Portsmouth in the United Kingdom and LM University in Munich, Germany have concluded that the likelihood of dark energy's existence stands at 99.996 percent. In 1967, Rainer Sachs and Arthur Wolfe theorized that light from the CMB that was left over from the Big Bang would become slightly more blue as it passed through galaxy clusters in space because of the influence of the cluster's strong gravitational fields (gravitational blueshift). This phenomenon is now called the Integrated Sachs-Wolfe (ISW) effect. Gravitational Redshift/Blueshift. Gravitational redshift occurs for fundamentally the same reason that projectiles on earth slow down when rising - because they have to transfer kinetic energy (speed) into potential energy (height). Projectiles, such as a cannon ball, do this by slowing down. Photons, however, cannot slow down as they are constrained to always travel at exactly "c", the speed of light. A photon sheds its kinetic energy "going through" a gravitational well (a void in the universe, almost no gravity) by lowering its frequency. A lower frequency means a longer, "redder" wavelength. The opposite process occurs when a photon is "coming out of " a gravitational well (i.e. passing through a galaxy cluster). The photon trades potential energy for kinetic energy and gains in frequency which shortens its wavelength to become more "blue", a blueshift. As photons pass in and out of space voids and galaxy clusters, the redshifts and blueshifts should normally cancel out. However, if dark energy is present in a our universe, a very slight ISW effect should be detected in the CMB here on earth. In a very large void in space, the photon's trip out would be slightly longer than the trip in because the void would have expanded slightly due to the "push" from dark energy. Therefore the photon would be stretched and be redshifted. The opposite occurs passing through a large galaxy. The photon would gain energy and be blueshifted. However, we are talking about a photon at the speed of light, and the ISW effect would be so very tiny as to be non-dectable directly by any of today's technology. The only possible way to detected such a tiny shift would be to statistically average the results over many observations from many different galaxies and voids at very large distances. The ISW question becomes "look at the CMB and check whether or not on average it is bluer in patches of the sky that have more matter behind them and redder in patches where there is less matter". Matter means both visible matter and dark (transparent) matter. Strong Evidence. 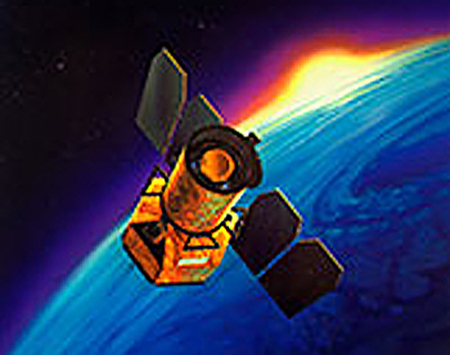 In 1996, astronomers Robert Crittenden and Neil Turok suggested that overlaying maps of the local universe on the map of the residual CMB radiation could provide clues as to where to look for the ISW effect. In 2003, ISW was discovered but it was very, very weak. Yet "Science Magazine" recognized it as being very significant and called it the "2003 Breakthrough Of The Year". However, some scientists argued that it could have been caused by cosmic dust and/or other phenomenon questioning "the discovery". Recently the Anglo/German team that carried out the initial study was again led by Robert Crittenden and Tommaso Giannantonio. They re-examined all the arguments against the ISW detection and improved the maps and data used in the original work. After a two year study, they concluded that dark energy is almost certainly responsible for the "hotter" differences of the cosmic microwave background. In September of 2012, they announced "We have methodically addressed all of the counter issues and concluded that none of them can explain the observations we see. The probability of dark energy's existence is indeed 99.996 percent" (or the same level of significance as the recent discovery of the Higgs boson). See the Dark Energy Is Real article.